They call him "The Old Man of the Lake"---a moniker fondly chosen for him by the people who live around the Great Lake To Nueng in the Tay Nguyen (the Central Highlands) province of Gia Lai. Rod in hand, Quach Trong Hoan, 74, from the Muong ethnic minority community, is often seen staring out into the wind-swept blue lake, from which he has rescued as many as 12 people from drowning and retrieved up to 68 bodies. Known as much for his charitable nature as for his bravery, he is also the father of 198 adopted children. He met us one sunny afternoon by a set of old stone chairs at the Van Ninh Temple where he lives, protected from the glare of the sunlight by a canopy of banyan, pine and bamboo trees that rustled in the wind. Pouring us a cup of tea, he paused to wipe away tears rolling down his cheeks with a towel he kept perched on his shoulder, as he recalled the most troubling experience of his life. On that fateful day, April 30, 2001, at about 9am, a group of 12 students holidaying at the Great Lake near the highland city of Pleiku rented a motorboat to cruise through its waters. Without warning, their boat crashed into a tree hidden just below the surface of the water and sank. Hearing their cries echoing from about 200 metres away, Hoan ran to the lake, dove into the water and pulled five students ashore. But he could not save seven others who remained trapped under the sunken boat. He later retrieved their bodies and requested charitable people to help the victims' families pay for coffins and a funeral service at the nearby cemetery. Tran Van Phan, 45, one of Hoan's adopted children, said the "Old Man" often visited families living around the lake, just to encourage them to find work. He offers aid to the poor, sometimes giving them rice, instant noodles, maize and sweet potatoes. Since he is a strong swimmer and expert diver, he rows out onto the lake every day with the primary purpose of searching and rescuing people in distress. "His most recent rescue took place under the Treo bridge. Siu Vip, an ethnic boy, had been playing there with his friends when he fell into the lake. Luckily, Hoan was working nearby and saved him," Phan noted. As a young man in 1965, Hoan left his home in the northern province of Ninh Binh to join the volunteer youth force. During this time of liberation war, Hoan was assigned to manage the local Ta Khong ferry, which transported troops, food and weapons from the north to the south of the country. Route 9 and neighbouring South Laos drew very heavy bombings from American warplanes throughout the day and night. Youths working on the ferry suffered many sleepless nights. Hoan recalled one night at the end of October 1966, after he had safely transported a group of soldiers from the north across the river. On arriving at his destination, he tied the ferry to a tree and fell asleep from sheer exhaustion. 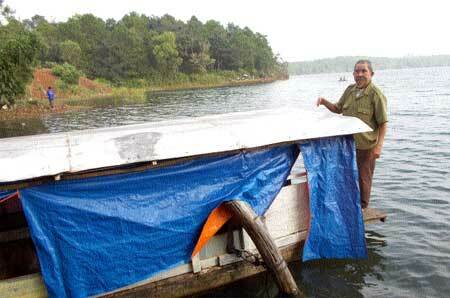 During the night, heavy rains caused a flood that swept away his ferry. When he awoke, he was shocked to find himself adrift on the Amahien River in Savannakhet Province in Laos. To his great relief, he happened across some Vietnamese volunteer soldiers. Giving them his ferry, Hoan made his way back to his unit. On another occasion, while transporting injured soldiers through the Great Lake region, Hoan found a beautiful vast green lake, with pine forests nearby. "(At the time), I made a wish that when the war ended, I would return to live there," he recalled. In 1972, he suffered a serious bout of malaria. A Van Kieu ethnic man helped him to treat the disease, and he recovered. Having escaped the Grim Reaper's "scythe of death," Hoan moved north to rest. There, he passed an entrance examination at the Economics University. After graduating in 1976, he volunteered to return to the Central Highlands to work for the New Economic Commission in Gia Lai. In 1991, Hoan grew determined to make his wartime wish come true. He resigned from his position and moved to Bien Ho Commune, where he purchased two hectares of land for farming and to go fishing on the lake. When asked about his wife and children, Hoan said in 1972, after returning home from the battlefield, he got married and had four children. His eldest son is now a lieutenant colonel in the police force of Gia Lai. His other son is an architect, while his two daughters have graduated from university and are working in the banking industry. His wife now lives with his eldest son. "She understands me and agreed to let me carry out my wish," he explained. Of the two hectares of land he bought, he now only has one hectare, having shared the rest with his adopted son and poverty-stricken neighbours, most of whom are ethnic Gia Lai, Ba Na and Se Dang. Perhaps most surprising of all are his 198 adopted children. "They are children I had saved from drowning and children from ethnic families living around the lake." One of them is Ro Cham Nul, 55, a Gia Lai ethnic man. Nul lost both his legs and one arm in a bomb explosion when he was looking for scrap metal. "I have no career. I am dependent on my mother, who is nearly 80 years old, so our lives are very difficult. On seeing our plight, Hoan gave us 2,000 square metres (of his land) to live on and grow vegetables and breed poultry, so we can make ends meet," Nul said. "Hoan visits us regularly. Sometimes he gives us a few kilograms of rice and noodles. He has been so good to us. We do not know how we can repay him," he said. Other neighbours living around the lake echoed these sentiments about Hoan. In 2001, "The Old Man of the Lake" found refuge in the Buddha, giving him the inspiration to build the Van Ninh temple, which looks simple, yet solemn. On the door, he wrote, "Anyone who needs me can call me", and below that is his phone number. In the temple, he venerates the Buddha and President Ho Chi Minh and has put up pictures of the children who drowned at the lake. His Kova Award for being a typical example of living one's life in service of society also adorns the temple wall. Before we parted ways, he said, "Life is only a transient cloud. We should do useful things for society. Anyone who needs me can call me!"